Microsoft has released Windows 10 Build 15063 to Windows Insiders on the both Fast and Slow ring for PC and Mobile several days ago via Windows Update. Windows 10 Build 15063 is widely speculated to be the RTM build of Windows 10 Creators Update version 1703 as Microsoft is scheduled to release Windows 10 Creators Update to general availability soon in April 2017. Microsoft is yet to confirm Windows 10 Build 15063 is the RTM for Windows 10 Creators Update. In fact, Microsoft has discouraged the use of term RTM, as Microsoft is expecting Windows 10 system to constantly be updated with Windows as a Service. But we still expect Windows 10 Creators Update to ‘finalize’ at a build, with a major version number that sticks until the next major update and all updates in between only increases its minor revision number. The ‘finalized’ Windows 10 Creators Update will also be ‘released to manufacturing’ (RTM) and is the version installed by OEMs onto new PC. 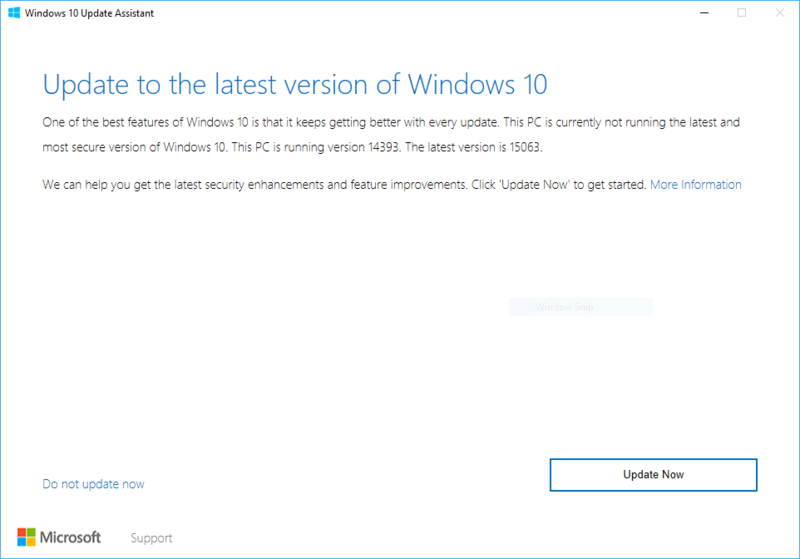 Microsoft has been providing Windows 10 Update Assistant utility to help users who want to upgrade to new version of Windows 10 to upgrade immediately without waiting for it to be offered via Windows Update. Microsoft has been providing several ways to upgrade to new version of Windows 10, such as from Windows 10 RTM / Windows 10 November Update (Build 10586) to Windows 10 Anniversary Update (14393), and this is expected to continue with Windows 10 Creators Update (Build 15063). In fact Microsoft has updated the Windows 10 Update Assistant utility to support Windows 10 Creators Update version 1703 (Build 15063). With the leak of Windows 10 Update Assistant by famous Windows leaker, WalkingCat. The message is actually similar when the tool is used to upgrade to Windows 10 Anniversary Update Build 14393, except the change of build number to reflect the release of Windows 10 Creators Update. Thus, Windows 10 Update Assistant has confirmed that Windows 10 Build 15063 is the RTM build number Windows 10 Creators Update. After Windows 10 Creators Update, expects another update in the Autumn with the codename Redstone 3 (RS3), which will include a brand new UI Project Neon.